According to this, I want to start new series of posts in which I’ll show you how to reproduce INSTAGRAM with Material Design on real Android devices. Of course, for obvious reasons, we’ll create only front-end mockup for this application, but we’ll try to reproduce as many details as it’s possible. In this post I’d like to reproduce first 7 seconds of showed concept. I think it’s enought for the first time, regarding to that we also have to prepare and configure our project. I’d like you to remember that all solutions which I’ll show you are not the only possible ways – they are my favorite ones. Also I’m not a graphic designer so all images used in our project are taken from public resources (mainly from Material Design avaiable on it’s resources page). In our project we’ll use some popular tools and libraries used for Android development. Not all of them we’ll use in this post, but I’d like to prepare project as much as it’s possible to avoid dealing with build files in close future. First of all we have to create a new Android project. For this I used Android Studio and gradle build system. Minimal version of Android SDK is 15 (Android 4.0.4). ButterKnife – views injection, for cleaner code (i.e. we don’t have to write findViewById() to get Views references but it also provides more powerful methods like onClick() injections etc. Timber and Hugo – not necessary in this project. I’m using them for logging only. In this project I used a couple of icons from Material Design resources. 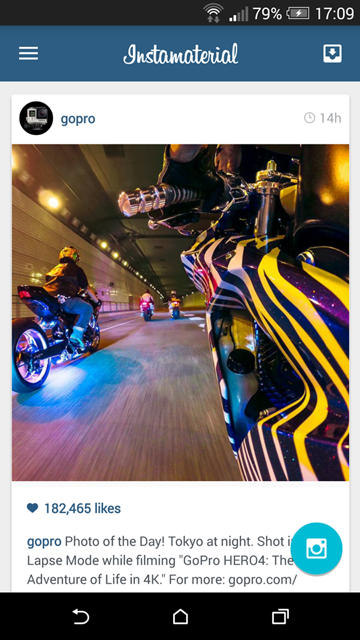 Also I made screenshots of GoPro profile on Instagram to provide mockups of our feed. App icon is taken from INSTAGRAM with Material Design video. Here is complete bunch of images used in project (whole drawable-xxdpi directory for now). Let’s start from defining default style for our app. The simplest way for providing base of Material Desing styles for both Android 4 and 5 is to inherit from Theme.AppCompat.NoActionBar or Theme.AppCompat.Light.NoActionBar. Why NoActionBar? Becase new SDK (and compatibility library) provide us a new way for implementing ActionBar pattern. In our example we’ll use Toolbar widget because of simple reason – it’s better and more flexible solution then ActionBar. I won’t dig into the details. Instead you can read it on Android Developers Blog in one of the latest posts about AppCompat v21. More details about what these colors are, you can find in Material Theme Color Palette documentation. Floating Action Button – simple ImageButton which is implementing new action button pattern introduced in Material Design. These dimensionas are based on values introduced by Material Design guildelines. The greatest thing with Toolbar is that now it’s a part of activity’s layout implementation and it’s also extending ViewGroup, so we can put some UI elements inside (they will use remaining free space). In our example we used it for putting logo image. Also while Toolbar is more flexible widget than ActionBar, now we have to do more things by our hands. So i.e. we have to set background to our colorPrimary (otherwise Toolbar will be transparent). RecyclerView is very simple to implement in XML file, but until we don’t configure it properly in java code our app won’t start throwing java.lang.NullPointerException (it’s connected with not configured LayoutAdapter which is resposible for arranging items inside RecyclerView). Elevation param doesn’t work for pre-21 Android. So if we want to show that our Floating Action Button really floats we have to implement different backgrounds for Android Lollipop devices and older ones. As you can see making shadow effect for pre-21 device is a little tricky. Unfortunatelly there is no simple way to achieve “real” shadow via XML file. Other options are to use prepared earlier shadow image or do it by using Outlineclass directly in Java code (hint for creating fab shadow). Now let’s finish our Toolbar. We have background and application logo so right now only navigation and menu icons are missing. Last thing we should implement is feed, built on RecyclerView. Right now we have to setup two things: layout manager (RecyclerView has to know how to arrange items) and adapter (to provide items). First thing is straightforward – while our layout is simple ListView we can use LinearLayoutManager for items arragement. For the second one we have to do more work, buth there is no magic to deal with. CardView – wrapper for our list item with rounded corners and shadow outline (which works on Android 21 and pre-21). ImageViews for feed elements mockups (SquaredImageView is our implementation of ImageView which has square dimensions). In case you missed something here you have commit for whole project which we have in this moment. Showing feed and floating action button after Toolbar animation will finish. Toolbar items animations are performed one after another in short period of time. The main problem with implementation of this animation is navigation icon – the only element which we cannot animate. The rest is pretty straightforward. First of all we want to animate our application only when we start it (not after i.e. we’ll rotate our device). Also keep in mind that we are animating menu item which isn’t available in onCreate() method (we are initializig it in onCreateOptionsMenu()). Thanks that startIntroAnimation() will be invoked once, after we start our application. preparation – here we have to setup initial state for every animated element. If i.e. we want perform expand animation, here we have to be sure that our item is hidden. animation – in this step our views are animated to final state or/and position. Animate Toolbar and inner items, one after another. After animation will finish, animate content (FAB and feed items). In this step we want to animate two things: FAB and feed. While FAB animation is pretty simple (just do the similar actions like described above), animating feed items is a little tricky. And… that’s all! If we build and run our project we have the final version showed at the beginning of this post. In case you missed something, here is commit for our project with implemented animations. Previous Previous post: MultiDex solution for 64k limit in Dalvik.